Many women have trouble saying no. Perhaps deep down, we still believe we must be good little girls, compliant and charming, so people will love us. But when we’re pushovers, others take us for granted — and we feel resentful. Here’s how to stop being a martyr without giving offense. Sleep on it. Your nephew asks for a loan. If you’re not sure how to respond, instead of agreeing now and kicking yourself later, say, “I’ll get back to you.” Take time to decide whether you have the means and the desire to comply, then give your answer. Set limits. If charity work eats up family time, for instance, resolve to volunteer only a certain number of hours. Once those hours are booked, decline all additional requests. Remember that yes rhymes with stress. If you agree to a task and then can’t follow through, it’s worse for everyone than if you had just said no from the get-go. 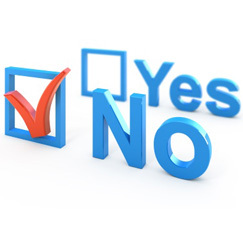 It’s far harder to change a yes to a no than it is to change a no to a yes.